Maybe this is your going to be your baby or grandbaby's first Christmas! 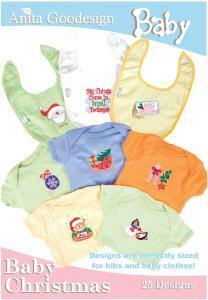 Well, here is your opportunity to embroider Christmas designs on his or hers onesie, bibs or blankets. With 25 cute Christmas designs and sayings to choose from, we know you are sure to find just the perfect one for that new little bundle of joy.